When Alex and I met this past weekend to discuss the state and future of this blog, we didn't just sit down for a business meeting and then go our separate ways. No no no. You see, we are geeks, and I'm one geek in particular who seldom gets out of the house anymore--give me a chance to roam around outside with another geek and there's no telling what might happen. Actually, it's pretty obvious what might happen. We went to the comics shop. Now, we live in an area that isn't terribly big on geek culture. We've got about two comics shops within a reasonably close distance, but the only store I can visit to buy D&D supplies such as books and minis is the nearby Borders, and that hardly counts. There's a GameStop and an EB Games around here where I can buy video games, but given my fondness for retro gaming, the nearest place I can find used games any older than about a year is on the Amazon. Dot com. With enough effort, I might be able to find Pocky or a few other Japanese imports scattered across a few different stores. Fortunately, the libraries around here have pretty diverse selections of books and movies, but the less mainstream a fandom is, the less likely it is to find a place around these parts that caters to those fans. Where I'm going with this is that taking a trip to anywhere remotely geeky is a refreshing from the norm, and going there with a friend who understands and uses geek lingo is even more refreshing. In a way, it's like being in a foreign country where you barely speak the language, and then you meet another person who speaks your language and invites you to a restaurant that serves food from your native country. A geek is not the only thing I am, but I find it's far easier to fully be myself when I have an outlet for my geekiness beyond my own home. We didn't spend a lot of time at the comics shop, but it was long enough to get that breath of fresh geek air I've been craving, to look at all those books on the shelves that Alex promises he has and will one day lend me, and to hear the idle chatter of people huddled around tables playing Magic: The Gathering. But before that, we went to the toy store. Following the release of the new Star Trek movie, I was curious to see what kinds of toys they'd produce. Growing up, I formed a large collection of Star Trek action figures, miniature starships, props, trading cards, and even a Star Trek V Marshmallow Dispenser. I kid you not. 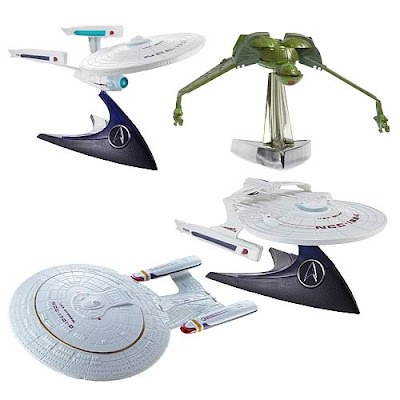 I wasn't planning on a huge shopping spree, though: I refuse to buy anything from the new Star Trek continuity (in part because of my feelings about the direction the reboot took, but mostly because it would be very expensive to keep up with everything). However, if there was anything from the past 40 years of Star Trek continuity to buy... well, that was a different story. Action figures were in abundance--I'm not sure I've ever seen a bigger variety of action figures at one time for any one property. There were even playsets for the action figures. Plural. It's a very good time to be a geek... just a lousy time not to have any money. What I wanted more than anything else, though, were starships to put on display. Fact: I once had my bedroom ceiling decorated with glow-in-the-dark stars and hanging Star Wars and Star Trek ships. It was so cool. 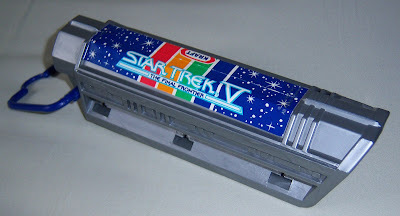 As luck would have it, Hot Wheels knew I was coming, and they prepared a set of five ships to buy, of which there were three different ones in stock: the Enterprise refit from Star Trek: The Motion Picture, the Enterprise-D from Star Trek: The Next Generation, and the Reliant, from Star Trek II: The Wrath of Khan. My stars, was it difficult to decide which one I wanted. I intended to show some self-restraint and only buy one, but when I couldn't even pare it down to the two ships I wanted most, I almost gave up and walked to the next aisle to see if there was anything I could decide on getting. At that moment, my lovely girlfriend called. "So, if you had to pick between the Enterprise refit, the Enterprise-D, and the Reliant, which would you choose?" Turns out she was in another store, looking at the exact same lineup of ships, trying to decide which one to buy. Well, that settled it. She took the Reliant, which she was leaning toward picking up (in part because the Klingon Bird-of-Prey was out of stock), and I took the two Enterprises. 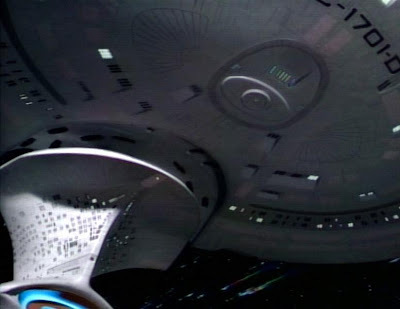 For the record, I would have just barely gone with the Reliant instead of the Enterprise-D, except the Enterprise-D model allowed you to separate the saucer section, and that won me over. Oh, right, not everybody has any idea what I'm talking about. So sorry. Where I'm going with this is that it's a wonderful feeling to be a geek and have places to be geeky and people with whom to be geeky and geeky stuff to buy, to bring the make-believe worlds of your favorite escapist fandoms a little closer to becoming your reality. Plus, I felt like a little kid again. I may or may not have sat at my computer, flying my Enterprise model around my head and making occasional "whoosh" noises.